As the final day of Electra Mining Africa 2018 themed ‘Diversity Day’ drew to a close, the Imilingo Mineral Processing team were upbeat about their diversified Electra experience. “We came into this with a great deal of enthusiasm and it hasn't disappointed in terms of our overall objectives to expand our horizons and build on our brand awareness,” comments Imilingo MD, Jaco Prinsloo. Electra Mining Africa is frequented by hundreds of exhibitors and thousands of delegates pass through the Nasrec exhibition halls each year. “There is a definite energy and buzz as you move around the halls. We’ve had the opportunity to network and also view the latest innovations in the industry,” comments Prinsloo. The free seminars at Electra celebrated the theme days with relevant content and speakers and various stands got involved in the spirit of the theme days with live displays and giveaways. This coupled with an expansive collection of machines, winches, robotics, mechanics, engines, pumps and the latest technology in the industry make Electra a worthwhile endeavour for delegates and exhibitors alike. 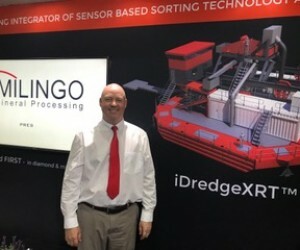 Imilingo showcased their modular iPlantTM products as well as their iDredgeTM and launched their latest innovation the iDredgeXRTTM, a world first in alluvial diamond mining at the show. The iDredgeTM has been in operation since May 2018 and is currently producing great success and prospects for Africa Resources in the DRC, while the iDredgeXRTTM commissioned by Monthe Real LDA in Angola is currently in the final design stages before fabrication which is expected to start early 2019. 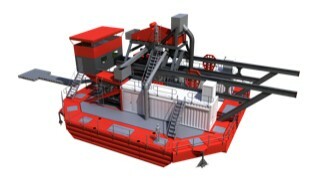 The iDredgeXRTTM will consist of a dredge housing two TOMRA XRT sorting machines, a submersible pump with excavators, a clamshell, a sizing screen and two diesel-electric generators to power the system. The dredge also includes three-dimensional sonar for viewing the pumping operations and global positioning system to track the locations where mining has been done. “The fact that only one processing step is required when utilising the XRT technology makes this solution a huge win in terms of process efficiency. In other words – the material is mined and then processed through the XRT Machine (one processing step) to achieve a hand sortable product (material quantity is small enough that no other mechanised step is required), “ comments Prinsloo. As leading integrators of sensor-based sorting technology, Imilingo is well positioned to change the alluvial diamond mining landscape. “TOMRA is a world leader in XRT technology and we pride ourselves on integrating that technology seamlessly into our fit-for-purpose solutions for our clients. The iDredgeTM has been a great step forward for us in transforming the landscape of operations and to now have the project of combining our ground-breaking dredging solution with the TOMRA technology in our iDredgeXRTTM is an exciting adventure we are embarking upon. We believe we are able to capture the opportunities within the mining industry to innovate and execute cutting-edge technology. We are excited about the prospects of this latest innovation in drastically changing the way alluvial mining is executed. Any opportunity to actively contribute to the sustainable transformation of the mining industry is a massive driving force for us.” says Prinsloo. 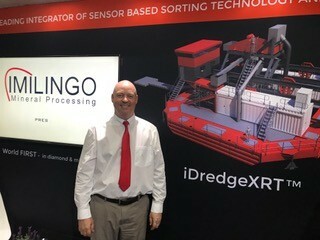 The products and services provided by Imilingo enjoyed an overwhelming response from delegates and media with a great deal of interest in their dredging solutions and XRT technology integration which they are confident will convert into tangible leads and sales. “We’ve had some great media coverage at the show and you never know what will come of the exposure. This has been a valuable exercise in which I have no doubt we will reap the rewards of in the future,” concludes Prinsloo.